One of the most recognized Hollywood landmarks is the Grauman’s Chinese Theater. Since it’s grand opening in 1927 to modern times the iconic movie palace has hosted thousands of grand opening premiers, and has been the home of the famous Forecourt of the Stars featuring the footprints and hand prints of many Hollywood superstars. As a result many Hollywood themed films such as “Singing In The Rain”, “Dancing In The Dark”, “A Star Is Born” (1937 version), to name a few, have briefly featured the theatre, giving it more on-screen cameos than any other theatre in the world. Amongst nine of these cameos were in animated films, two that took place entirely at the theatre. 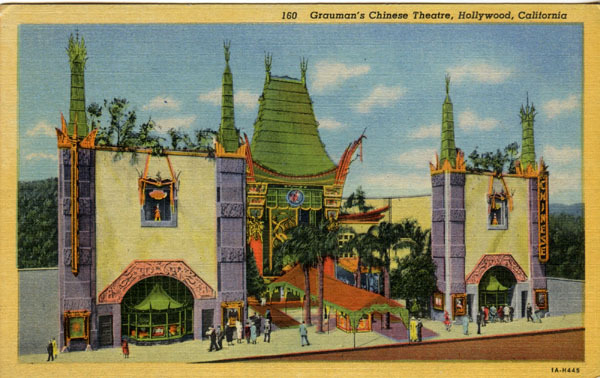 As the focus of this article is to explore the Chinese Theater’s various appearances in golden age cartoons it’s not overly appropriate to give a full, unofficial definite history of the venue. However interested readers who wish to know the whole story, a deeply researched technical history of the Chinese Theatre may be read on “GraumansChinese.org” that provides detailed articles loaded with pictures to help visualize the auditorium, equipment, and renovations throughout it’s glitzy life. To be short, the Chinese Theatre was envisioned by Sid Grauman, a notable showman who is credited by many historians for starting the trend of ornate and exotic movie palaces across the United States and is also credited to contributing the glamour associated with Hollywood throughout the 1920s into the 1950s. 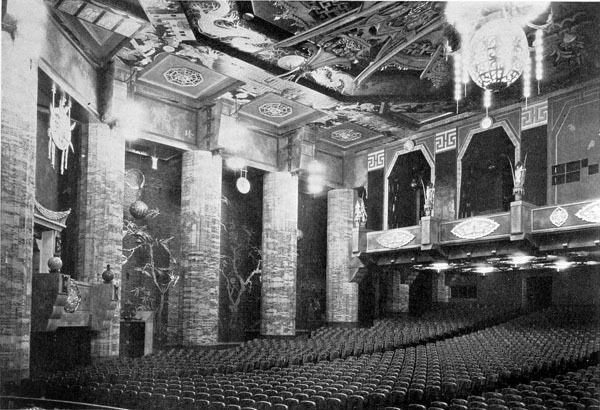 Though the Chinese was not Grauman’s first theatre as he previously constructed others, such as the Grauman’s Egyptian Theatre, the Chinese was his most ornate, exotic and expensive theatre. 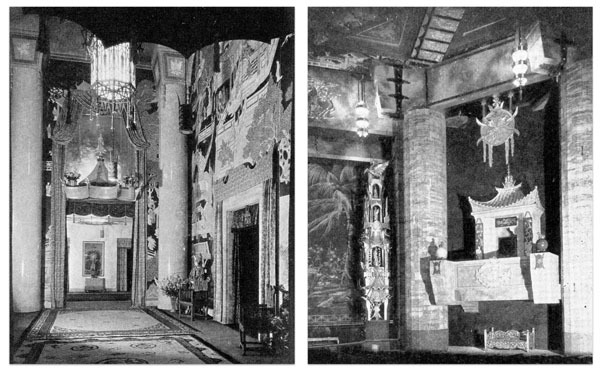 The architect of Grauman’s dream palace was Raymond Kennedy, of the Meyer and Holler Architectural firm, who designed the architecture inside and out to be authentic to traditional Chinese buildings and pagodas. The theatre was decorated throughout with exotic Chinese styled fixtures, chandeliers, furniture, carpets, statues, and even wax figurines. Many features such as it’s temple bells, stone heaven dogs, statues, etc. were imported from China, and even required authorization from the United States government to be brought in. The famous forecourt, which would become it’s most notable asset than the theatre itself, was not originally intended to be part of the theatre as it is stated to have been personally created by accident by Mr. Grauman during the theatre’s construction. Two photographs from “American Theatre of Today” by R.F. Sexton and B.F. Betts. The photo on the left shows the foyer beautifully decorated with Chinese styled fixtures, chandeliers, furniture, carpets, statues, wax figurines etc. The photo on the right shows the right front side of the auditorium. Note the freestanding bronze pagoda on the stage and the signing box that sticks out. The theatre opened on May 18, 1928 with the grand premiere of Cecil B. De Mille’s “King Of Kings”, which is credited by many trade ads and newspapers (both from the 1927 to modern times) as being the most spectacular Hollywood premiere ever staged. Along with showing De Mille’s biblical epic the theatre featured an elaborate stage prologue “Glories of the Scriptures” that was envisioned by Sid Grauman and fully demonstrated the talents and imagination of his theatre. The premiere of “King Of Kings” along with the opening of the theatre with Grauman’s prologue was highly successful and paved the way for thousands of spectacular Hollywood premieres to be held at the theatre. It also paved the way for hundreds of appearances in Hollywood films, ranging from rags to riches narratives to various travelogues. The Disney studios depiction of the stage. Note the freestanding bronze pagodas on the stage and the signing boxes that stick out. These would be removed from the actual building in 1953. Sid Grauman proudly takes tickets from Hollywood celebrities coming out for Mickey Mouse’s gala premiere! 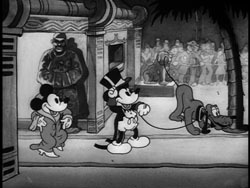 The most notable animated appearance of the Chinese Theatre was in the 1933 cartoon “Mickey’s Gala Premiere”, produced by Walt Disney Productions and distributed theatrically by United Artists. It was directed by Burt Gillett and unfortunately the artist responsible for the background artwork is a mystery. 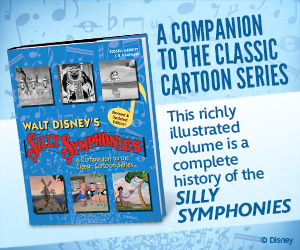 (Disney historian JB Kaufman, believes that Carlos Manriquez and/or Emil Flohri may have been responsible for it). This animated cartoon that gives Mickey Mouse a much deserved Hollywood grand premier is notable too many for several reasons. 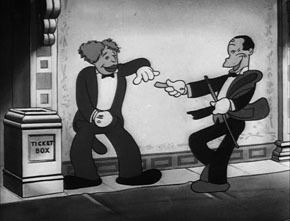 To begin with, the film accurately showcases to contemporary audiences the extreme popularity of Mickey Mouse and Walt Disney During the 1930s. Many viewers also enjoy the cartoon for the appearance of almost fifty caricatures of Hollywood stars (including one of Sid Grauman) of the era. One other detail however the cartoon should be recognized a bit more for is for it’s portrayal of the Chinese Theatre. Mickey Mouse entering the theatre. Note the depictions of one of the stone heaven dog statues and the wax figurine. 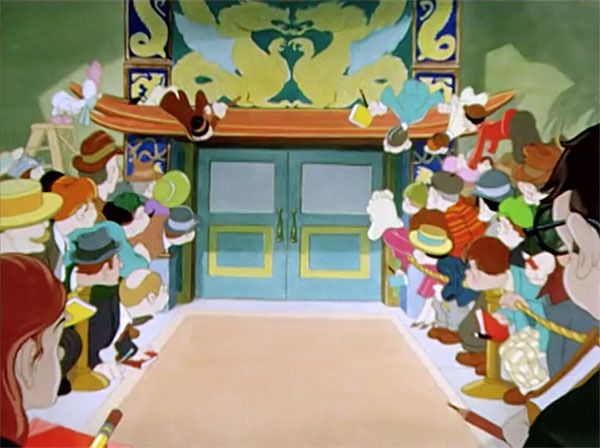 The film, released five years after the Chinese’s grand opening, is the only animated cartoon (to the author’s knowledge) that depicts it’s interior, auditorium and proscenium in a manner similar to how it was originally envisioned by Sid Grauman and Raymond Kennedy. While the Disney Studio’s depiction is no where near as ornate as the theatre itself and even in some shots not quite accurate, it is detailed enough to show off the exotic movie palace in a manner that is not too overwhelming. Two notable shots are that of Mickey Mouse entering the theatre, and later the shots of the stage and proscenium. The shot of Mickey entering the venue with Pluto and Minnie shows off one of the stone heaven dogs statues and wax figures that were stationed around the theatre. The shot showing the stage proscenium (especially the second one following the exhibition of the Mickey Mouse cartoon), depicts the orchestra pit, the original signage boxes that stuck out, and the original free standing bronze pagoda decorations located on either side of the proscenium. (The only detail that is not quite historically accurate here is the curtain; the actual asbestos curtain was far more ornate and featured Chinese styled artwork.) The free standing Pagodas were made entirely out of bronze and were used to help decorate the stage for exhibition of traditional 35mm films, but could also be removed for one of Grauman’s elaborate prologues and/or for the exhibition of the short lived interest of widescreen features during the early 1930s. The signing boxes, orchestra pit, and freestanding pagodas would disappear in 1953, with the auditoriums extensive remodeling to exhibit cinemascope movies. Fortunately the theatre was not extensively streamlined/modernized as was being executed on many theaters during the post-World War II era, and was done so in a manner that maintained its Chinese architecture. If anything, the modifications were performed to upgrade the experience of the Theatre’s grand premiers. The Signing boxes were redesigned and flattened so they did not stick out and block the Cinemascope screen. (An excellent prior and after photo can be viewed on GraumansChinese[dot]org). The orchestra pit was no longer necessary as the prologues had ceased since 1935 and thus was completely removed and replaced with stairs allowing easier access to the Stage. In addition the Proscenium columns on either side of the stage were also removed for the wider screen. Sid Grauman had no input on the changes to the Chinese Theater as he passed away in 1950 and it’s unclear whether the Theatre’s architect, Raymond Kennedy (who passed away in 1976) was involved with the changes. 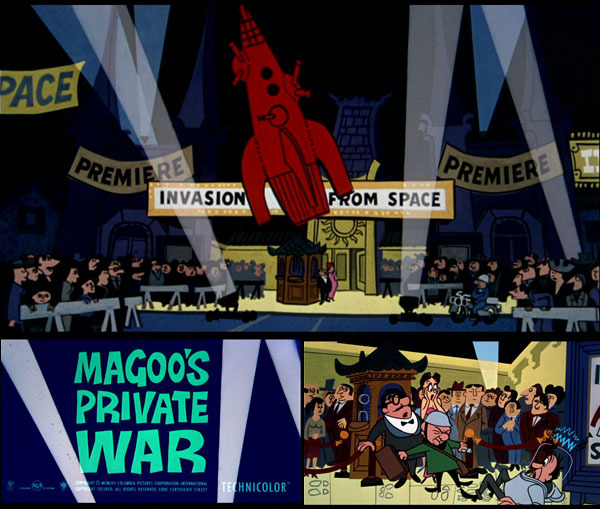 Four years following the Cinemascope remodeling the second animated cartoon that took place entirely at the Chinese Theatre was released, 1957’s Magoo’s Private War. The film produced by UPA, distributed by Columbia Pictures and directed by Rudy Larriva. The cartoon centers around Mr. Magoo acting as an civil defense air raid warden who mistakes the grand premier of a science fiction movie as an actual alien invasion. Now while the theatre hosting the grand premier is not officially identified in the film, it does feature notable characteristics that in the author’s opinion does link it as the Chinese Theatre. The exterior shot of the movie palace features in simple UPA fashion the sun burnished towers on either side of the forecourt and the “Great Tower” entranceway (which only depicts it’s actual exotic ornate artwork as a simple sun). Another shot the shows the forecourt of the stars with a few cement footprints. The depiction of the theater’s interior is simple and is decorated with only several Chinese styled patterns, and is nowhere near as fantastical as Mickey’s Gala Premier. While Magoo’s Private War, is not one of the funniest Magoo cartoons, it’s still an interesting entry to some degree when comparing it to “Mickey’s Gala Premiere”, made 24 years earlier. 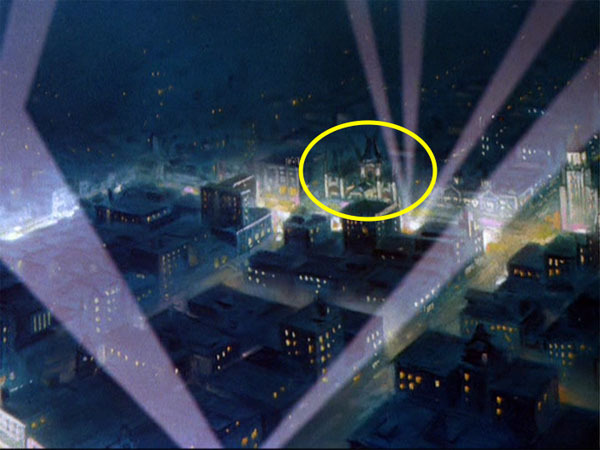 A still from “Hollywood Steps Out” with the Chinese Theatre highlighted in the yellow circle. Tex Avery’s fun look at Hollywood celebrity night life, featuring a wide array of caricatures of Hollywood superstars partying at the then popular Ciro’s Nightclub, briefly features a view of the Chinese Theatre. 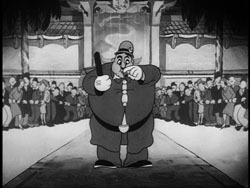 The theatre can be seen at the beginning pan of Hollywood, about 30 seconds into the cartoon on the Blue Ribbon re-issue. Unfortunately because of the small depiction, the amount of time it appears on screen and the distraction of the dancing search lights, it’s difficult to notice unless viewers are knowingly looking for it. Another one of Screen Gems’ run of the mill “Color Rhapsodies” that takes the viewer on a tour of Hollywood CA. 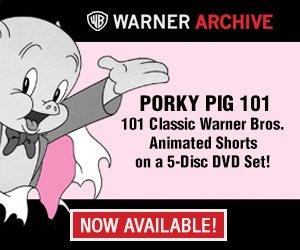 While the film tries to mimic Tex Avery’s Warner Brothers’ entertaining travelogue spoofs as well as “Hollywood Steps Out”, it does feature several nicely drawn, semi-ornate visuals of notable Hollywood landmarks in beautiful Technicolor. Amongst one of them is the ‘celebrated’ Chinese Theatre that makes an appearance three minutes and fifty seconds into the cartoon. This sequence shows a nice colorful depiction of the exterior that highlights some of it’s more noticeable architectural features, the Hollywood forecourt, and a small sequence of several ‘ever present autograph seekers’ tackling John Barrymore. One observation regarding the Barrymore joke is how the close up of the Chinese Theatre entrance only features one set of double doors while the prior wide shot accurately depicts three. Bob Clampett’s hilarious Bugs Bunny cartoon briefly features a few live action Technicolor shots of the Grauman’s Chinese Theatre and the foot print forecourt in the opening sequence. The ending of this fun Disney feature length production features a brief animated shot of the Chinese Theatre. The giant from Edgar Bergen’s telling of Jack and the Beanstalk (that features Mickey Mouse, Donald Duck, and Goofy), is searching for the three characters around Hollywood and carefully walks around the theatre. It should be noted that the depiction of the theatre features a sign, stating ‘Grauman’s Chinese’. This sign was never officially installed permanently onto the theatre, as elaborate lighted signs were temporarily installed here for the grand premiers of various movies. A photograph of the Chinese Theatre, and one that seems to have been colorized (in a manner commonly seen on postcards of the era) by Famous Studios for the film, makes an appearance four minutes into this travelogue ‘spoof’ and sing-along on California. This cartoon was discussed in depth by the author for Cartoon Research back in Summer 2015. In a nutshell, the Grauman’s Chinese Theatre makes an appearance in this semi-entertaining industrial cartoon that highlights Sunny the Prune’s rags to riches journey from growing in Sunsweet’s tree fields to becoming a nutritious Hollywood Superstar. 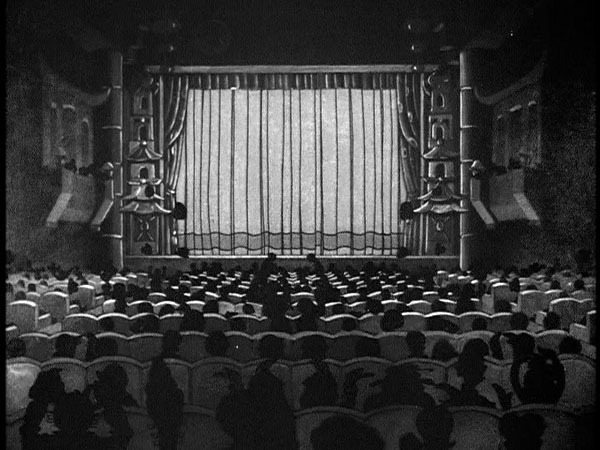 The theatre is featured in the opening shot and it’s appearance is kept at an extremely minimum and it’s depiction is rather simple graphically and is never shown in it’s entirety. It should be also noted that the cartoon features one of the only animated caricatures of notable commentator and narrator John Nesbit who is hosting the premiere at the the Chinese Theatre. One of the more interesting run-of-the mill Casper cartoons that were cranked out by Paramount during the 1950s. (Probably the author’s fourth favorite featuring the friendly ghost). This Casper entry revolves around the friendly Ghost’s footprint ceremony at the Grauman’s Chinese Theatre and a telling of his coming to Hollywood and finding success at Paramount Cartoon Studios. 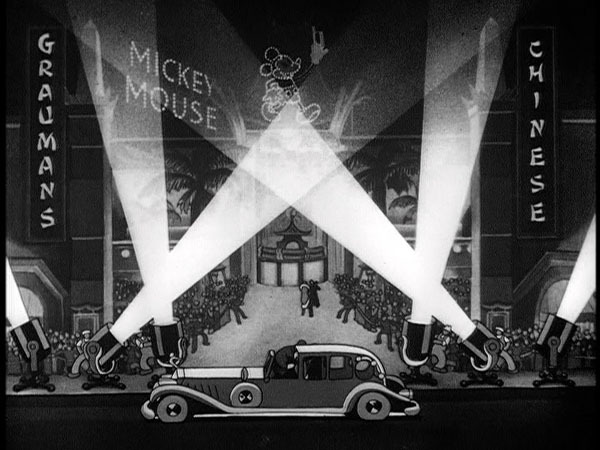 The cartoon is filled with modern artwork by Robert Owen depicting a Paramount cartoon studio building (a fanciful Hollywood version, as the actual studio was in New York City) and the Grauman’s Chinese Theatre. The sleek stylized visuals of the Grauman’s Chinese Theatre are beautifully crafted and ornately illustrate the theatre in a manner that brings out it’s noticeable architectural features. And it’s very well possible that the Chinese Theatre made appearances in other animated films; If the author missed any, please mention them in the comments section. One observation readers and viewers may have noticed about the animated films is the absence of the famous twin dragon neon marquees that are located (and still present) on the left and right side of the theatre. The marquees were not installed onto the facade until 1958, during a renovation so the theatre could exhibit movies in ‘Cinemiracle’. The installation of the marquees required the removal of the vertical signs that had been featured in the various animated films listed above. A Special Thank you to Jerry Beck, Rick Prelinger and J. B. Kaufman. Much of the research contained in this article regarding the Chinese Theatre was retrieved from GraumanChinese.org. Grauman’s Chinese features prominently in the 1997 feature “Cats Don’t Dance”, as the third act takes place during a movie premiere there in 1939. Also from the same year, Disney’s “Hercules” had a brief shot of Herc putting his footprints on cement. Although no likeness of the theater is shown, Herc does sign a dedication to Sid (Grauman) next to his prints. Another interesting fact about “Mickey’s Gala Premiere”: It came out shortly after the Academy of Motion Pictures presented a special award to Walt (one of two Academy Awards he received that year) for the creation of the character. Don’t forget the well-known opening sequence from THE PINK PANTHER show, in which the Panther and the Inspector arrive at Grauman’s Chinese in a live-action car! The live action Technicolor shots of the Chinese in “What’s Cookin’, Doc?” are re-used from the Janet Gaynor version of “A Star Is Born” (1937). 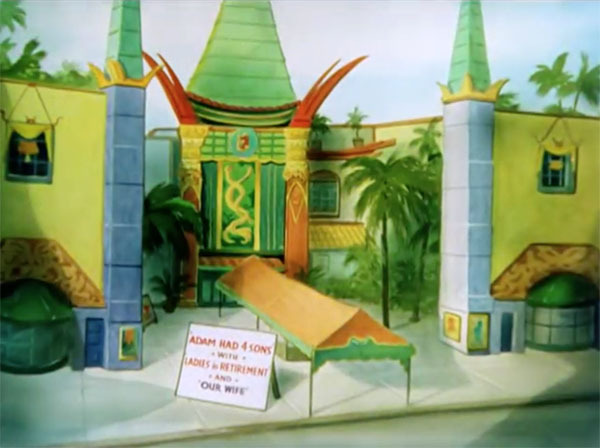 The Chinese Theater appears briefly in a Woody Woodpecker’s short, entitled “The Shutter Bug”, from 1963. In this short film,Woody is constantly besieged by a paparazzi. Renamed Mann’s Chinese Theatre from 1973-2001, it has an appearance in a 1999 Simpsons episode, “Beyond Blunderdome” (With a pan over to the decidedly less ornate Chinese Man’s Theatre). And as a topper to it all, the theater’s current name is now the “TCL Chinese Theatre”, TCL itself is a Chinese multinational electronics firm based in Guangdong Province. In some way, it has come full circle for the theater, itself inspired by China to be finally owned by them. Whoa, Harman and Ising still had a studio in the ’40s and ’50s? I knew that Harman had retired in ’55, but that was just…wow. Harman on his own was doing films, mostly for industry and educational purposes. A few that were covered here include Stokely Van Camp’s “Easy Does It” or the dental tale “Winky The Watchman”. Hugh also collaborated with educational film company Coronet Films on a few animated shorts such as “The Littlest Angel” and partially worked on a short called “Tom Thumb in King Arthur’s Court” during the early 60’s. Another of Hugh’s later attempts was a pilot to a TV series called “The Adventures of Sir Gee Whiz on The Other Side of The Moon”. The Mann Chinese Theater was shown briefly on the Tiny Toon Adventures episode Hollywood Plucky where Harrison Ford (in his Indiana Jones costume) was putting his handprints in the Chinese Theater’s courtyard. Plucky ruined the moment by stepping into the cement that Ford was putting his handprints in and asking for his autograph. Ford responded by using his whip to tie up Plucky – and Hamton had to literally drag Plucky out on the Chinese Theater’s courtyard. “Rodent to Stardom,” right after the credits (in case you don’t want to watch the rest of this 1967 Daffy-Speedy conflict).